Rising nationalism in Russia is combined with a lack of warmth towards the West, Aliya Sayakhova learns as she reads the British and Russian press. Schools are out for summer, meaning children everywhere around the world are enjoying months off and probably wasting plenty of time and cash screaming on rides and jumping in inflatable castles. Russian kids however have a much more exciting – and more patriotic – way of spending their holidays and parents’ money - at a 'military Disneyland'. 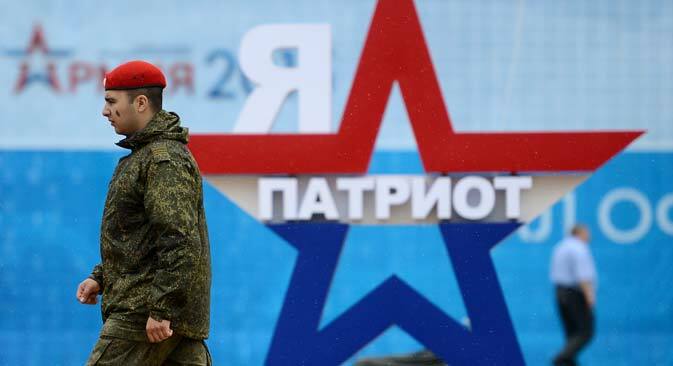 Park Patriot, the new military theme park at Kubinka, an hour’s drive from Moscow, was launched last Tuesday in the presence of president Vladimir Putin who described the park as part of Russia’s ‘military-patriotic work with young people’. Separately, he announced plans to buy 40 new intercontinental missiles for Russia’s nuclear arsenal. The 5.5 hectare park, due for full completion in 2017, will become a site of annual arms exhibitions, as well as a holiday destination, with cafes, hotels and shops alongside the military “rides”. A chain of Patriot Parks will open across the country. In the rest of the world summer recreational options are also on the rise. America traditionally offers a wide range of summer fun activities both for its own citizens and international guests: parks, festivals, and camps from the Burning Man to Coachella draw thousands of visitors from across the world. A new addition, according to Russian news sources, is the first cannabis camp that is due to open in the US state of Colorado in July. CannaCamp is summer recreation camp for marijuana enthusiasts that will offer its visitors cookery classes, massage therapy, art and yoga sessions – all involving the use (while hopefully not abuse) of the cherished weed. Marijuana was legalized in Colorado in 2013, along with 20 other US states. At the federal level however it remains prohibited in America, just like in Russia. The cannabis ban may be one of the few things that Russians and Americans still agree on, yet the countries seem to be divided on a range of other subjects. Business Insider published an overview of how Russians view the West and their own country, based on Pew Research findings. The research revealed that many Russians believe Western powers are to blame for the bad economy, and that Russians do not particularly like the US: in fact, Pew found that only 15% view the U.S. favorably. Russians also have a dim view of Barack Obama: only 11% believed the American president would "do the right thing regarding world affairs," – a substantial drop compared to his 2012 approval ratings of 28%. Although Russians are critical of Western politics, they often view America as a country they would like to live in: according to a 2013 poll on economist Mikhail Delyagin’s @delyagin blog, 9.3% out of 619 respondents wanted to live in the U.S. It came third only after Russia and the Soviet Union - the winner of Delyagin’s readers’ hearts. In 2010, Rossiyskaya Gazeta published a poll showing that three quarters of Russians would rather leave the country to seek happiness abroad. Arguably, the latter figure could be very different for 2015 though, not least thanks to Patriot Parks. Why go abroad when you live in the world’s biggest country, one might ask? There are few issues that Russians find troublesome, yet only one is considered a truly nationwide problem: bad roads. Vast distances, the harsh climate and widespread corruption all fade into insignificance against crumbing tarmac. Realizing the futility of fighting with nature and the state at the same time, Russians seems to have adopted a rather Buddhist path of acceptance and humor in dealing with the issue. In Saratov, activists have turned to a more proactive approach. A street artist has painted caricatures of local officials over gaping potholes, transforming them into comically grotesque mouths in order to demonstrate the poor state of the roads, the Guardian reported. A 20-year-old graffiti artist Vikenty Belikov painted a portrait of local governor Valery Radayev over a giant pothole where, the week before, a large municipal truck had become grounded. Street art in Russia however does not always oppose power and those who exercise it. The Real Russia YouTube channel (which has 60,000 followers and almost 20 million views) reports that in Ufa authorities are collaborating with street artists. The city has provided artists with designated areas to express themselves – many on downtown streets. Perhaps not surprisingly, the graffiti is uncontroversial and does not question corruption, bad roads or any other social problems that exist in Ufa. Instead, it is devoted subjects such as the first man in space Yuri Gagarin, Russian artist Mikhail Nesterov (1862-1942), the Great Patriotic War of 1812, and dancing Bashkir ladies. Patriotism appears very topical in Russia these days indeed.